…what if politics, but too much? Two film genres that have enjoyed a recent resurgence in popularity are the teen coming-of-age and LGBT genres. You only need to look at the 2018 Oscars, which had Call Me By Your Name and Lady Bird facing off against each other, to see their increasing prominence. Love, Simon combines both genres and is another adaptation of a young adult romance book (Simon vs the Homo Sapiens Agenda by Becky Albertalli). And whilst many YA romance films are predictably mediocre, this film averts that quality pitfall spectacularly. Love, Simon is one of the best films of the year so far. Love, Simon follows Simon Spier (Nick Robinson), who lives with his parents (Josh Duhamel and Jennifer Garner) and little sister (Talitha Bateman). 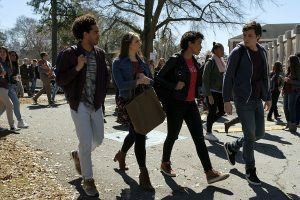 He goes to high school with his friends Leah (Katherine Langford), Abby (Alexandra Shipp) and Ethan (Jorge Lendeborg Jr). Whilst he has a strong bond with all of them, he keeps his homosexuality secret. He finds out about Blue, an anonymous person at his school who is also closeted, striking up a pen-pal relationship with them and falling in love. He tries to figure out who Blue really is, but is soon accosted by Martin (Logan Miller), who knows his secret and blackmails him, making the secret harder to maintain. Though this story is ripe for it, there is no unnecessary drama, such as a third-act breakup that is handled sensitively. The entire conflict is kept small, personal and natural. The mystery of who Blue is, is never too convoluted or predictable. Even the reveal of Blue’s identity is not delivered in an overdone manner, instead being an “Oh, that’s who it was” moment that fits the themes of acceptance and love well. Those themes give the story extra weight and Simon’s struggle to embrace his identity will be relatable to those who have gone through similar experiences. The focus for most of the runtime is on these weighty issues of sexuality and identity. They result in plenty of powerful moments that will result in only the hardest of hearts being unmoved. Despite this, the tone is never too heavy. There is a lot of humour that comes from both character interactions and Simon’s narration and all of them landed for me. One example of the great humour is Simon’s fantasies, such as a dream sequence about college that makes fun of gay stereotypes, and a scenario where Simon’s friends come out as straight to their parents. The characters are the driving force of the story and they are all well written. Simon is not perfect, and the film does not shy away from having him make dumb mistakes and poor choices that he must apologise for and amend. His friends have their own relationships and flaws, with each getting their own mini-arc that mirror Simon’s. Even Martin, the closest thing to a villain, is not a stereotypically evil homophobe. He is an annoying jerk who does some terrible things, but his lack of a relatable motive, along with his over-the-top attitude, makes him a “love-to-hate” character. Simon’s parents are as quirky as you would expect parents in a teen comedy to be, but they are soon revealed to be emotionally complex. The acting is also fantastic across the board. Nick Robinson proves himself to be a star in the making as Simon. He is painfully real and likeable, and he sells every emotion. All his friends are just as good in their supporting roles, with Katherine Langford and Alexandra Shipp showing why they are talents to watch out for. Jennifer Garner, Talitha Bateman and the underrated Josh Duhamel get their moments to shine, particularly towards the end. Tony Hale as the embarrassing vice principal and Logan Miller as Martin give the most OTT performances. Whilst some might call their acting obnoxious, I found them utterly hilarious and cringeworthy in an effective way. Greg Berlanti takes a break from CW Superhero shows to helm this film, and he proves to have an amazing grasp of this material. His direction is sometimes stylized (especially during the various fantasy sequences), but he mostly stays back and lets the actors perform. The pacing is perfect, as he injects plenty of energy and emotion into every scene that always keeps it entertaining. The fun soundtrack keeps this energy up in the comedic scenes and Rob Simonson’s score is just as effective in the dramatic moments. Love, Simon is an entertaining and moving crowd-pleaser that will probably become a future classic in the teen and LGBT genres. Teenagers and LGBT people will find it highly relatable, but it is accessible to all audiences. It is full of heart and character; the actors are great and there is humour and drama to spare. Prepare to laugh, cry and be uplifted. Copyright © 2013-19 CUB Magazine.